When you final approve a report in Expensify, we'll automatically export it to NetSuite, using the setting you've defined in the Export section of your connection. If you're using Expensify's Direct Deposit ACH, when an expense report is reimbursed in Expensify, the corresponding Bill Payment will be automatically created in NetSuite. That process runs once per-day. What happens if the report can’t be exported to NetSuite? There are a number of reasons why your reports may fail to export to NetSuite. Before, the preferred exporter would receive an email, outlining the issue and any specific error messages. Now, any error messages preventing the export from taking place will also be placed in the Report History and Comments section of the report. The report will also be placed in the preferred exporter’s Inbox, where they can fix any issues. Need any help? Check out our NetSuite Export Errors page and export manually. This option allows Expensify to import your employees from the selected NetSuite subsidiary, invite them to your Expensify policy and set the approval workflow. When new employees are imported to Expensify, an email informing them they have been added to the policy will be sent to their email address. The policy Approval Workflow will be defaulted to Manager Approval, importing NetSuite approval workflows directly into Expensify. 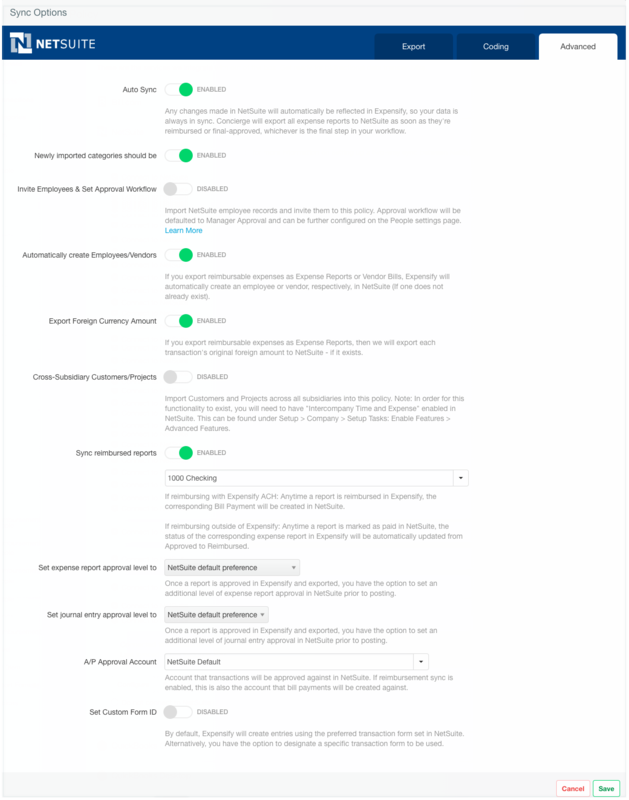 Approval Workflow can be further configured on the policy People settings page after configuring your NetSuite connection. Need to restrict the workflow? You can enforce the workflow in your settings here too! A single level of approval, where all users submit directly to a Final Approver. The Final Approver defaults to the policy owner, but can be edited on the people page, shown above. Two levels of approval route reports first to an employee's NetSuite expense approver or supervisor, and second to a policy-wide Final Approver. By NetSuite convention, if no expense approver exists, Expensify will map to the supervisor. 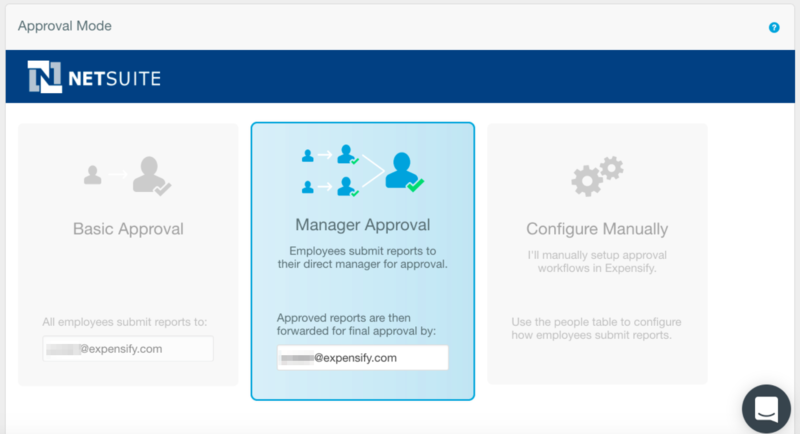 Employees will be imported, but ALL levels of approval must be manually configured on the policy's People settings page. This option will automatically create a new employee or vendor from the email of the report submitter (depending on your export settings) if one doesn't already exist in NetSuite. This allows you to import Customers and Projects across all subsidiaries into your policy. Please note that in order for this functionality to exist, you will need to have "Intercompany Time and Expense" enabled in NetSuite. This can be found under Setup > Company > Setup Tasks: Enable Features > Advanced Features. If using Expensify Direct Deposit ACH and exporting reimbursable expenses as Expense Reports or Vendor Bills, when an expense report is reimbursed in Expensify, the corresponding Bill Payment will be automatically created in NetSuite. To enable this feature, click on the toggle in the Advanced Settings and select the appropriate account for the Bill Payment transaction. The selected account will need to match the default account for Bill Payments in NetSuite. Alternatively, if reimbursing outside of Expensify, this feature will update the status of the expense report in Expensify from Approved to Reimbursed when the respective report is paid in NetSuite and the corresponding policy syncs next via Auto-Sync or Settings > Policies > Group > [Policy Name] > Connections > Sync Now. You can set the approval levels based on your export type. Expense Reports: the options are NetSuite default preference, Supervisor approval only, Accounting approval only, or Supervisor and accounting approved. Vendor Bills or Journal Entries: the options are NetSuite default preference, Pending approval, or Approved for posting. Note: If you have approval routing selected in your accounting preference, this will override the selections in Expensify. If you do not wish to use approval in NetSuite go to Setup > Accounting > Accounting Preferences > Approval Routing and make sure Vendor Bills and Journal Entries are not selected.